“Hi folks! This is what you’ve been waiting all season for. This is why you drink them beers! This is why you buy those jerseys! This is why you do all that! Well here we are. Tonight we start the second step in our quest for Calder glory. We’ve got the team to do it, but make no mistake, it won’t be easy. In round one versus Providence, time got away from me and real life played a role. That’s why there was no “Hockey Night” post to get you ready for game 3 at the PPL Center. With that rousing win, I didn’t want to change anything headed into a potentially clinching game 4. Really proud of the crowd at those games. We had the team ready to go, and then some. In fact, as team and fans settle into this playoff hockey thing perhaps we can find our level a little better. The first game started with such a fever pitch, and then the goals started to pour in and the Bruins never really recovered; they didn’t know what hit them. Game 2 looked to be going in the same direction, although the team was so pumped that the passes were a bit sloppy and they lost some precision in their jump. Nevertheless, another early lead. Then the line brawl started, and while I said to Junior, “Maybe not the best tactic for the Bruins, in front of this ravenous crowd,” the resultant penalties and clean-up took so much time, it did seem to take the wind out of the sails of both the team and the crowd. Strong play from the Lyon King and a miracle shot from Lamarche in overtime ended up clinching it for us. Believe me, I was doing a little “clinching” of my own up in there. I’m thinking maybe the intermissions need to be about re-setting the pitch. The game-ops department did a great job with the hype video and the pre-game. Maybe we play it out a little for the “rejoin” by playing old hype videos? Just something to get the crowd back in. End the shenanigans a little earlier and get folks back to their seats a little earlier. The loss of league MVP Phil Varone is significant, of course. While we’re a deep talented team, you don’t sit down the top scorer without feeling the effects a bit. He’s been skating non-contact for now and may be able to return later in this round. It looks to be a shoulder. Big Sam Morin has continued to skate full practices lately. He likely won’t play tonight but is a possibility for tomorrow. Assuming he doesn’t come back slow or rusty, I think we could really use his size on the blue line versus Charlotte. Forward Misha Vorobyev has been out since April 8, but has also been skating full practice lately. He is a possibility for tonight, and I’d welcome his play-making ability and defense. It sounds like forward Tyrell Goulbourne was limited at practice this week. It is not known the extent of his potential injury, but there’s a possibility he’s not in the lineup tonight, which would cost us some toughness and physicality. It’s not just about fighting. His energy on the ice draws as more penalties than he commits. A couple extra power plays wouldn’t hurt against such a good scoring team in Charlotte. D Reece Willcox has missed some practice time as well. His status is unknown. D Will O’Neill has been a healthy scratch, and has paired with Sam Morin at practices as the fourth pair. I’d like to have some of his veteran presence in this round–but that’s just me. G Anthony Stolarz has been practicing fully, but I’d think he’s the third or fourth option at this point behind Lyon, Tokarski and maybe Muse–although Muse doesn’t always practice, probably for playing time reasons. ICYMI: D Travis Sanheim and F Oskar Lindblom returned from the Flyers when they were eliminated by the Penguins. The addition of those two NHL players is huge for the Phantoms, and gives those players some additional playoff experience as well. 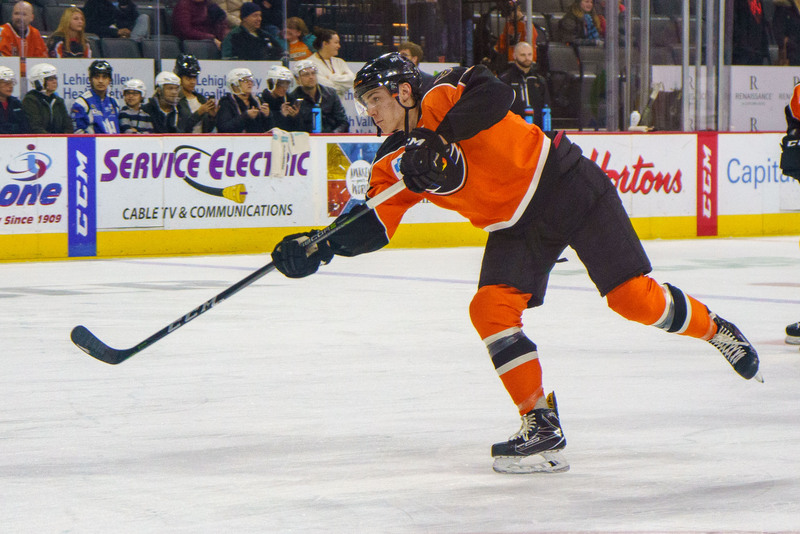 Forwards Danick Martel (2 goals, 3 assists) and Chris Conner (2 goals, 3 assists) paced all Phantoms with five points each in Lehigh Valley’s opening round series victory against the Providence Bruins. Martel, Conner, Greg Carey, Mike Vecchione and Oskar Lindblom each scored two goals apiece in the opening round of the 2018 Calder Cup Playoffs. Six of Lehigh Valley’s 14 goals in the first round were scored by first-year skaters (Lindblom/Vecchione – 2, Phil Myers, Mark Friedman). Goaltender Alex Lyon was brilliant in Lehigh Valley’s first round series win over Providence. The second-year netminder produced a 2-1 mark in three starts to go along with a 2.76 goals-against average and 0.930 save percentage. He notched at least 31 saves in all three appearances, including a career-high 49 denials in series-clinching Game 4. Defenseman T.J. Brennan currently leads all Phantoms with 54 career AHL postseason games and 41 AHL postseason points (18 goals, 23 assists). Meanwhile, Conner is second with 43 career AHL postseason appearances and 30 playoff points (10 goals, 20 assists). The Phantoms’ power play was an impressive 4-for-14 (28.6 percent) in their opening round victory against Providence. Meanwhile, Charlotte’s man advantage was just 1-for-15 (6.7 percent) in the first round vs. Wilkes-Barre/Scranton. Lehigh Valley went 42-1-5 when scoring three or more goals during the regular season and is 3-1 in the postseason in that circumstance. Meanwhile, the Phantoms went 41-6-5 when allowing three goals against or fewer during the regular year and are 3-0 in such games in the playoffs. The Phantoms were 30-4-6 when scoring first during the regular season and are 2-0 when netting the game’s opening goal in the playoffs. What’s more, Lehigh Valley was 19-4-10 in one-goal contests this year and is also 2-0 in one-goal tilts this postseason. The Phantoms paced all AHL teams with a league-best 27 home wins in going an impressive 27-6-5 at PPL Center during the regular season. Lehigh Valley closed the regular year on a seven-game home winning streak and has won nine straight outings in downtown Allentown and has produced a sensational 19-1-2 mark at PPL Center since January 13. We know the puck won’t drop until 7:20 or so, but I recommend being in your seat by 7:00 to soak in the atmosphere and get ready for the pre-game show. Or, better yet, be there by 6:40 or so in order to let our team know how we feel when they come on the ice for warm-ups. The Community Deck on 6th Street is now regular ticket parking–pay on the way out. I had some difficulty with the ticketing system last Sunday, as well. It may not be the most efficient method of egress, so choose other parking if you want to avoid that. I believe the Walnut Deck at 8th is the same, but at least there’s an attendant to help with the checkout process so no jammed tickets or the like. Pricing can be variable: I’ve paid $6 a couple times–same as event parking–but $2 and $4 a couple times as well. Good seats are still available. Indeed, lots of them. This is the first game which is not included in season ticket plans, so it’s the folks who bought their seats for the post-season, folks who bought ticket strips and single-game sales. That’s it. Minimal groups. Minimal corporate. Don’t be alarmed, this is the way it is in the playoffs in the minor leagues and we’ve seen it with baseball as well. Bring the noise and it will feel just as full as ever! My experience on the baseball side is that the small but ravenous crowd can be twice as loud as a larger but more complacent one. And, more fun to be part of, as well. Wear orange. It’s an orange-out, and for now I can’t change jerseys anyway because we’ve been winning. I believe they’ll give you an orange “rally towel” at the gate. Use it often. Bring one from home too if need be. Bring a bell. Let’s do this! As per usual, the first thing I’m looking for is who leads the team onto the ice during warm-ups. That’s your starting netminder. 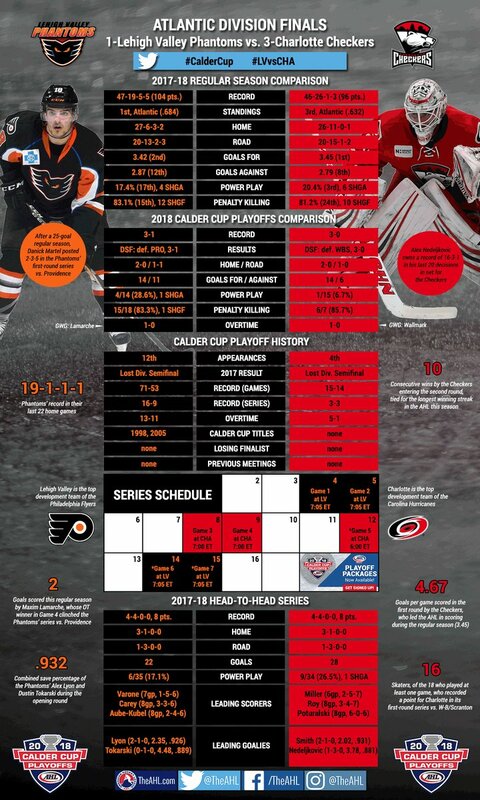 Prior to the Providence series the prevailing thinking among those who cover the Phantoms was that it would be Alex Lyon’s net for the whole tournament. However, we learned after the second Providence game that Gordon had intended to split those two games with Tokarski, but changed his mind and then went to Tik in game three. I’m looking for Lyon tonight, especially coming off that last Providence game–but don’t be surprised if we see Tokarski tomorrow regardless. Remember, Tokarski has playoff experience, performed well in the first round, and has earned the opportunity to play in the playoffs with his regular season contributions. At this juncture, I have full confidence in both of them. Watch to see how the team starts the game. Are they too hype? Are the passes good? They had better not be flat, but watch for that as well. I’m reading some quotes from Gordon about using some different strategy versus Charlotte. That team is big and fast and scores a lot. They’ve been stocked for the playoffs by their parent club. It will be interesting to see if we can notice anything different in the style of play or the lines used during the game (remember, warm up lines can sometimes be deceiving). I am glad to hear that this kind of thing is being thought about–not just throw the guys out there and see what happens and nobody but the fans care. Putting players in the best position to succeed and setting the standard should play dividends not only for this team this year, but for those guys as their careers progress. I thought Danick Martel and Nic Aube-Kubel were kinda quiet in that first round. Look for one or both of them to find the back of the net or set something up tonight. As Sanheim quickly re-acclimates to the AHL game, watch for him to get on the scoring list a couple times tonight with goals and/or assists. Watch out for those refs. Golly, bring your special towel, or whatever. I hate having game 1 of this series be a “Koharski Game.” I think Ritter is one of the guys guilty of the “pump fakes” on the face-offs as well. Will be interesting to see how they impact the game. Make no mistake, they will impact the game. I know some folks were disappointed to learn that we had to start last round on the road, but still, three home games is more than two, and I’ll take it. I also didn’t mind that they could go on the road and try to steal a game–sure it would have been big pressure to come home 0-2, but we are such a good home team it could be done. Ultimately, we did steal a game and all the pressure was on Providence coming into our place. What I’m getting at, is that now we start a 2-3-2 format, 7-game series, and we really need these first two games, right out of the box. There’s no time to “feel things out” –if they get to steal one and go home for three games with a chance to close it out with a sweep, or force us to win the final two at home, that would be huge for them. Regular season Atlantic division championship and first-round playoff win will mean nothing if we can’t at least take the division championship. Charlotte is good. No quarter, man. Close the door, put out the light. We need these games.